We provide exhibit graphics, banners, trade show enhancements items, and special event products to some of the more high profile companies in the valley. We can custom cut and router special material. We can also make prototype labels to be used as give-aways. Our experienced designers can work hand in hand with your design team to ensure color and appearance consistency and our seasoned manufacturing team are committed to make every impossible deadline a reality. 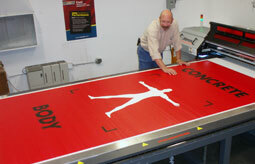 We can ship your custom printed banner complete with banner stand and carrying case. Click here for details. The Cellotape account management team has over 15 years of trade show and marketing communications experience so they will be able to foresee any obstacle that might be on the horizon. They can assist you with new material ideas, demonstrate ways to get the most out of your budget, and hand hold your project from design to delivery. In short, we will be an extension of your project management and marketing communications department whose goal is to make you successful.